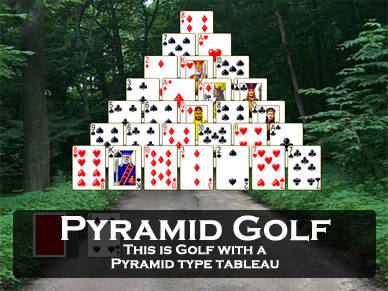 Click on the screen shot of the game Pyramid from Pretty Good Solitaire to download the 30 day free trial version. 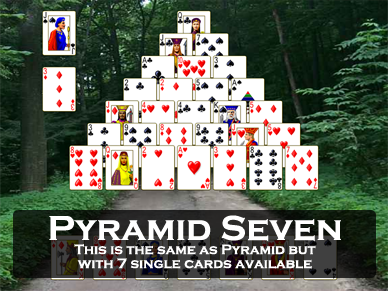 Pyramid is the classic solitaire game of addition. Addition type solitaire games are games where cards are paired or grouped according to the ranks (numbers) of the cards. 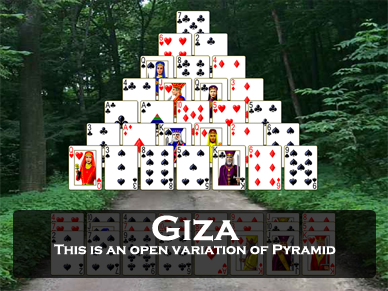 Pyramid is the most popular game of this type. 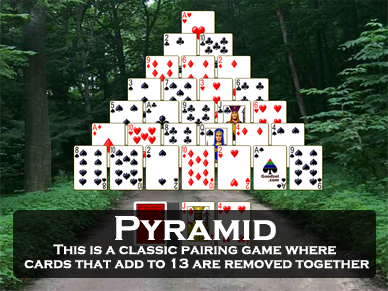 In Pyramid, cards are paired that add to 13. Jacks count as 11, Queens as 12, Kings as 13. Since a King is 13 all by itself, rather than being paired each King is simply removed by itself. The possible pairs that add to 13 are Queen-Ace, Jack-2, 10-3, 9-4, 8-5, and 7-6. My version of Pyramid in Pretty Good Solitaire allows you to play offline, full screen, with complete undo and my unique right click quick move. 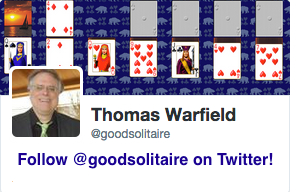 It's the best way to play solitaire! Pyramid for Windows 10 or Mac! In this video I explain how to play Pyramid. Download Pyramid Now and play along! At the start of Pyramid, 28 cards are dealt out face up in the form of a triangular pyramid. One card is dealt to the first row, then 2 cards to the second row, 3 cards to the third, and so on down to 7 cards in the final seventh row, making a total of 28 cards. The cards are dealt in overlapping fashion so that each card is partially covered by 2 cards in the row below it. Only cards that are not covered by any other card are available for pairing. The remainder of the cards form a stock and are dealt one at a time to a waste pile. Both the top card of the stock and the waste are available, so it is possible to pair them. The top card of the stock and waste can be paired with any available card in the pyramid, and two available cards from the pyramid can be paired together as well. In its purest form, there are no redeals. Usually, though, up to 2 redeals are allowed. The primary strategy is to decide how to pair the cards when there are choices. Often you are faced with the choice of pairing two cards in the pyramid or pairing one of them with a card in the stock or waste. A balance must be maintained. On the one hand, you want to deplete the pyramid so that you can get at all the cards. On the other hand, you need to pair the cards in the waste pile as well, because if the pyramid is depleted but many cards remain in the waste, you won't be able to pair up all the cards in the waste no matter how many redeals there are left. Under these rules a very good player can win 30-40% of the time, while an average player wins about 15% of the time. There are a number of variations of Pyramid. You can change the number of redeals, or deal cards 1 at a time or 3 at a time. 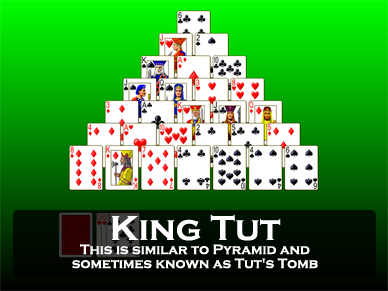 The variation where 3 cards are dealt to the waste and there are unlimited redeals is called King Tut (or Tut's Tomb). In one folk variation (not in any book that I have seen), it is allowed to pair 2 cards in the pyramid when one card is covering the other. However, that makes the game rather too easy and is not in the spirit of the game. A particularly interesting variation of Pyramid is Giza, invented by Michael Keller. Instead of a stock and waste, the remainder of the cards are dealt out into 8 piles of 3 cards, making it a fully open game. 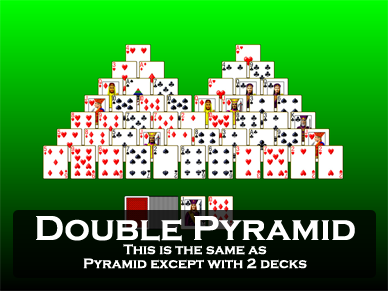 In older solitaire books, Pyramid is usually called "Pile of Twenty-Eight". 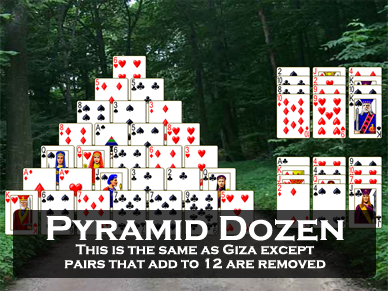 If that is too much, Pyramid is also in our cheaper and smaller game Most Popular Solitaire (30 games). 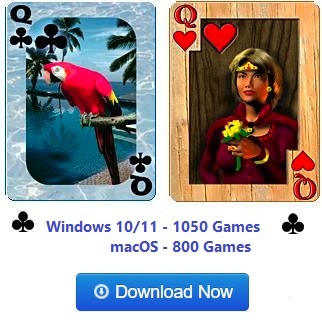 You can download the free 30 day trial version of Most Popular Solitaire here.